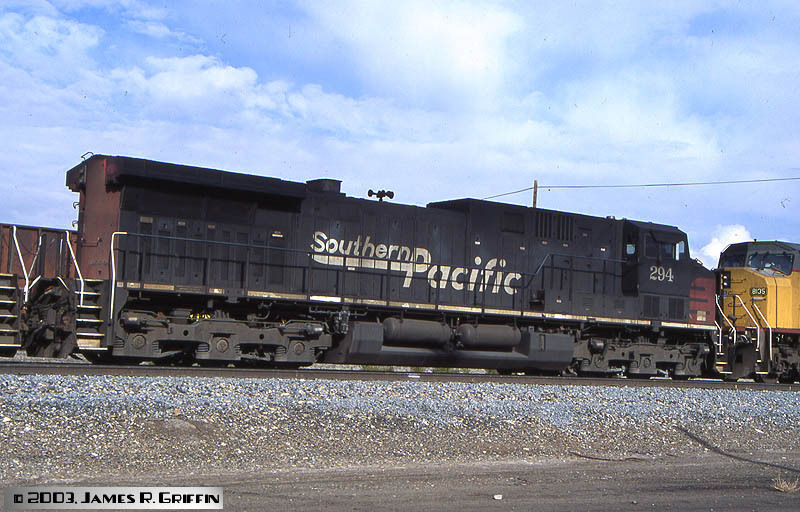 In 1995, the Southern Pacific Railroad purchased a fleet of brand-new locomotives from General Electric to relieve its power crisis. SPL had been cash-strapped for years, and much of its motive power was worn out, over-used and under-maintained. 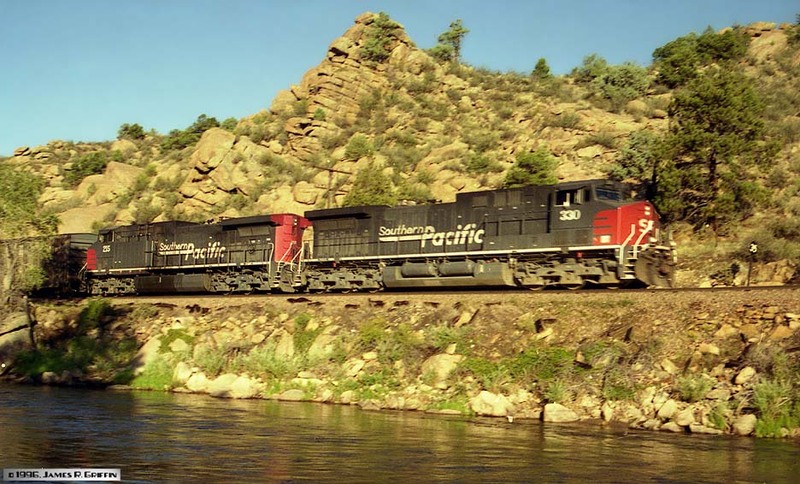 Several years after the merger with Rio Grande, SPL was just beginning to show signs of economic health, and after much testing decided to spend money on GE’s newest locomotives, which utilized alternating-current technology. 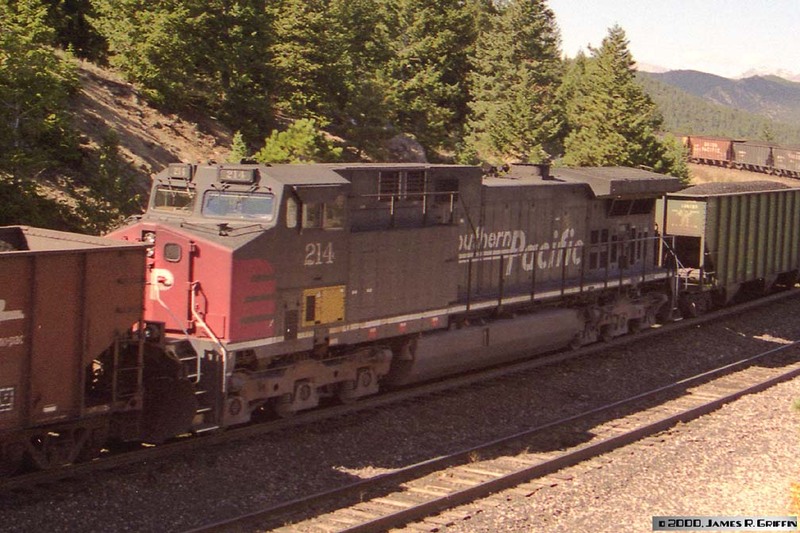 The AC4400 line was designed for high tractive effort at low speeds, just the thing for a railroad that operated a lot of coal trains in the mountains. The three-phase AC traction motors produce maximum horsepower throughout their speed range with little or no overheating, unlike DC motors. 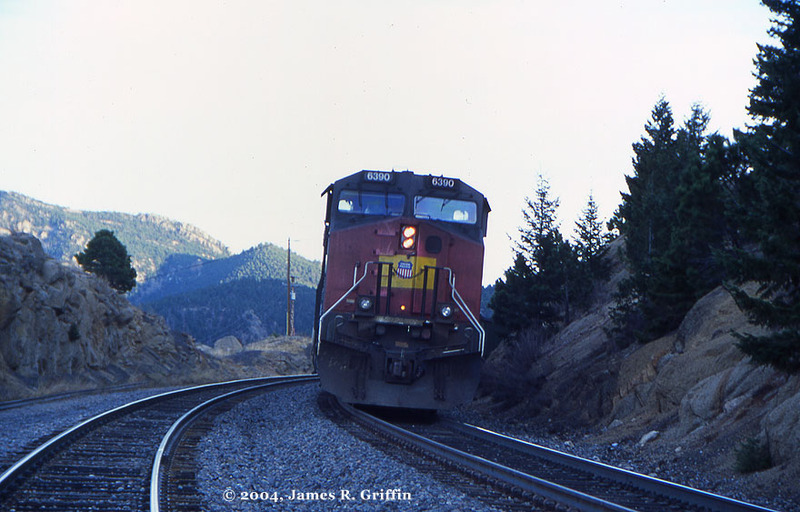 Heavy grades and sharp curvature in the Rockies would put the technology to the test. 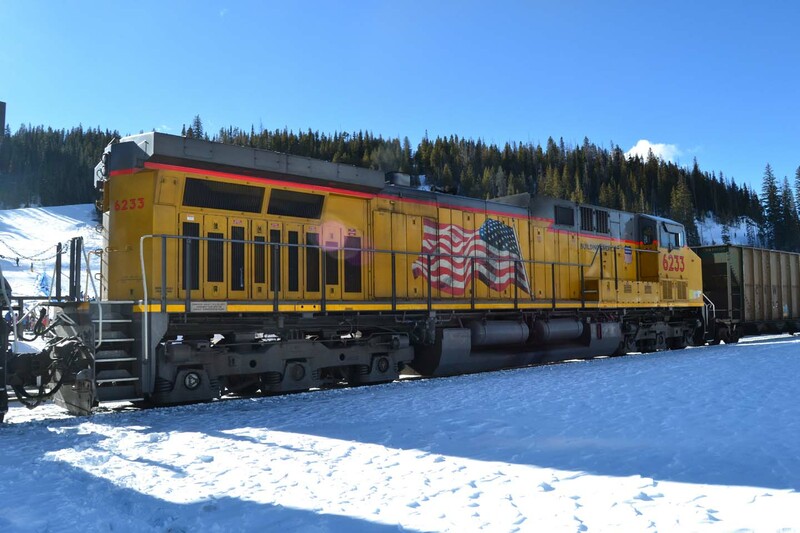 A simultaneous technological development, Distributed Power (radio-control of remote locomotives, usually abbreviated DPU, for Distributed Power Unit), increased the versatility of these units. However, DPU controls were not installed in the first 100 units of SP’s order. out of a dedicated helper base. 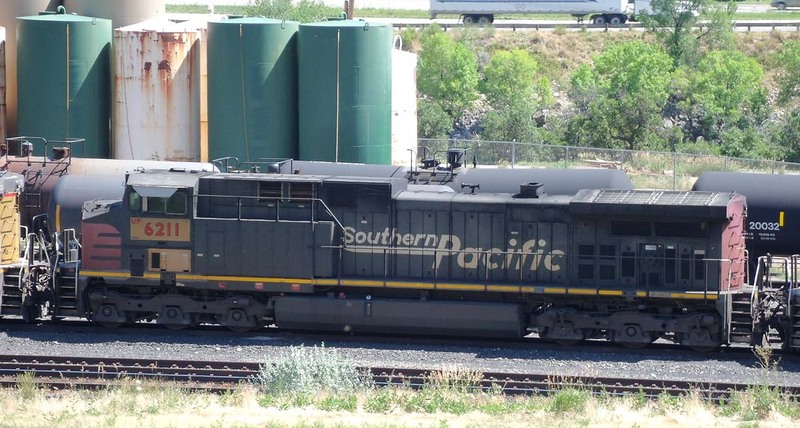 The acquisition of the AC4400’s was the last major locomotive purchase by SPL before the merger with Union Pacific, coming a mere 16 months beforehand. As a result, they have spent most of their service life with UP. After a few years, they were caught up in the renumbering program, just like most other power acquired in the merger. Initially this generally meant the addition of a yellow patch on the cab with the new UP number, but over time more and more have been completely repainted. 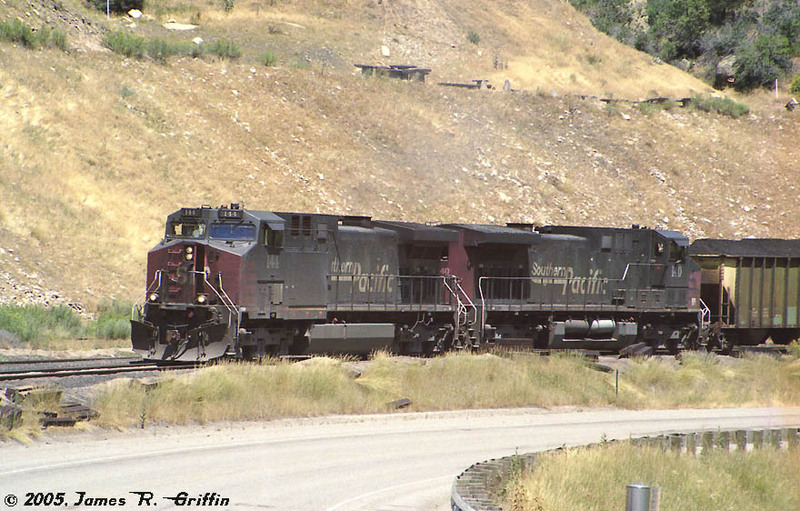 Aesthetically, there is no denying that they were strikingly beautiful when new; even the professional railroaders of my acquaintance remark on this. 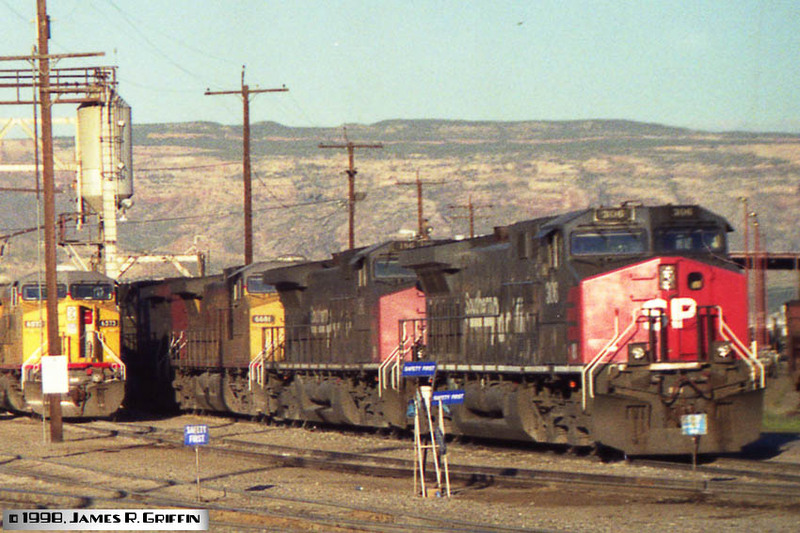 They were far more reliable than most of the existing power (Grand Junction crews referred to the older units as “that red-and-gray crap”). I lamented the loss of the older power they replaced, but I didn’t have to ride on them every day– the crews thought they were a big step up. Another spotting feature is the small white lightning-bolt emblem on the side of the nose, rear edge of the “wing”, on 200-378. This indicates a DPU controller unit. One main difference between the SP AC4400’s and their UP counterparts (C44AC) is that the SP versions do not have an isolated cab. Essentially, the UP units have some additional cushioning and acoustic insulation that makes them quieter for the crews. Espee chose not to spend the money on the option when they placed their order. Having ridden in the cab of No. 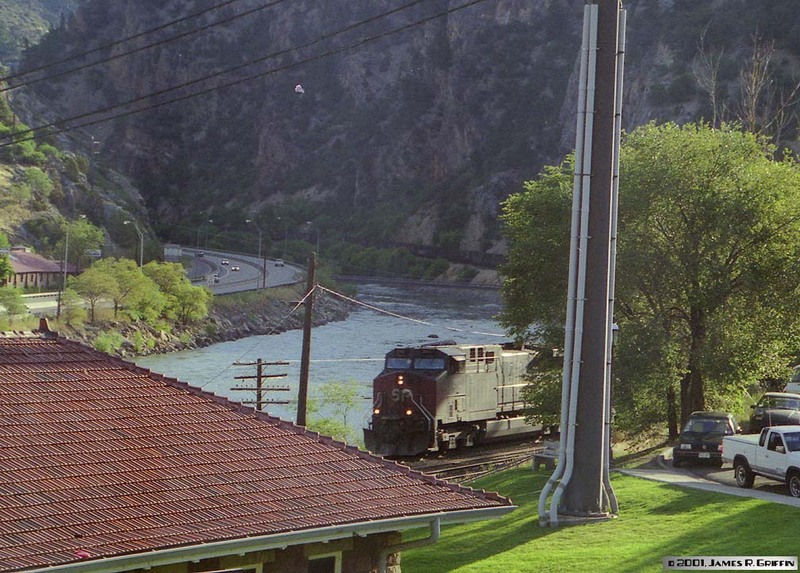 277 between Grand Junction and Glenwood Springs, I can say that it would have been money well-spent! 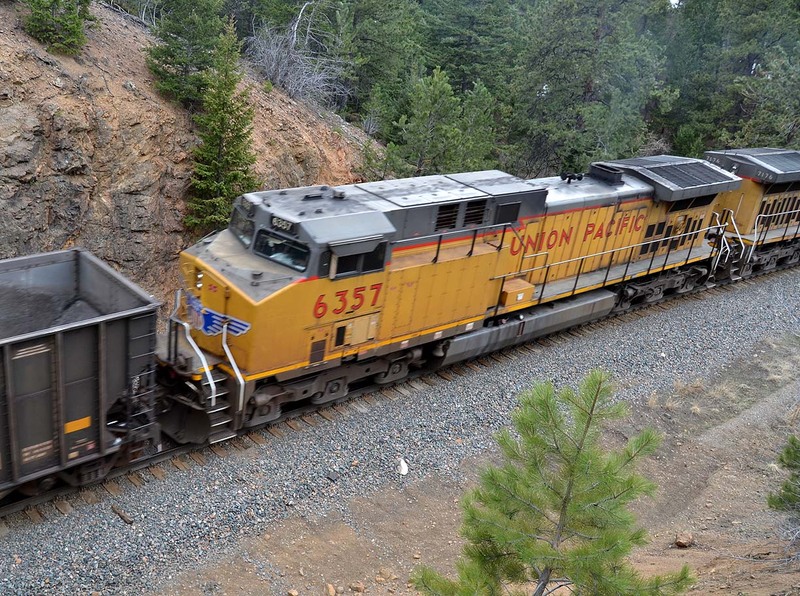 The noise level in the cab when the train is running at Notch Eight is significant (you need hearing protection). With the near-completion of the patching program, these unique units have lost some of their special identity. In that light, I decided to create this page of images to remember the heyday of the red-and-gray AC4400’s, and to track what has become of them. The photographs below the table are arranged chronologically. However, you may also jump directly to specific units by using the table. Brand new trio of AC4400’s, Nos. 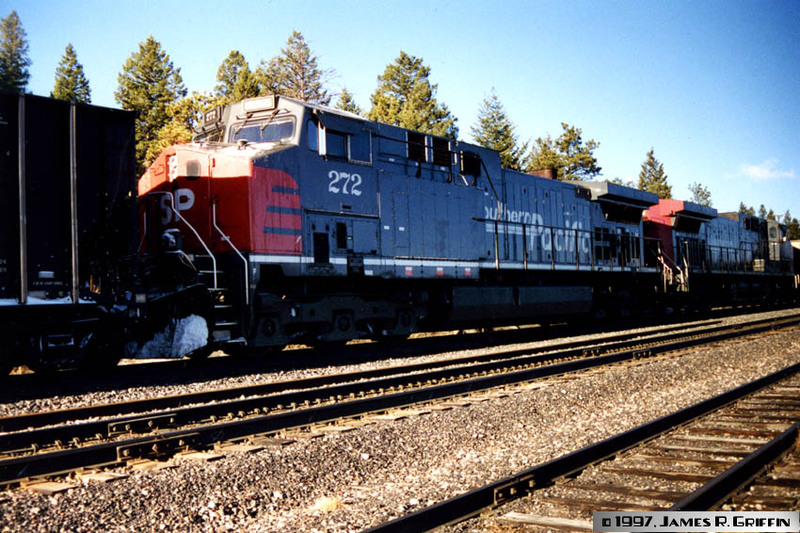 130, 219, and 200 are seen at Grand Junction on June 25, 1995. They are a month old, and look resplendent in shiny scarlet and lark gray. Sadly, the paint formulation for the red would oxidize badly over time. 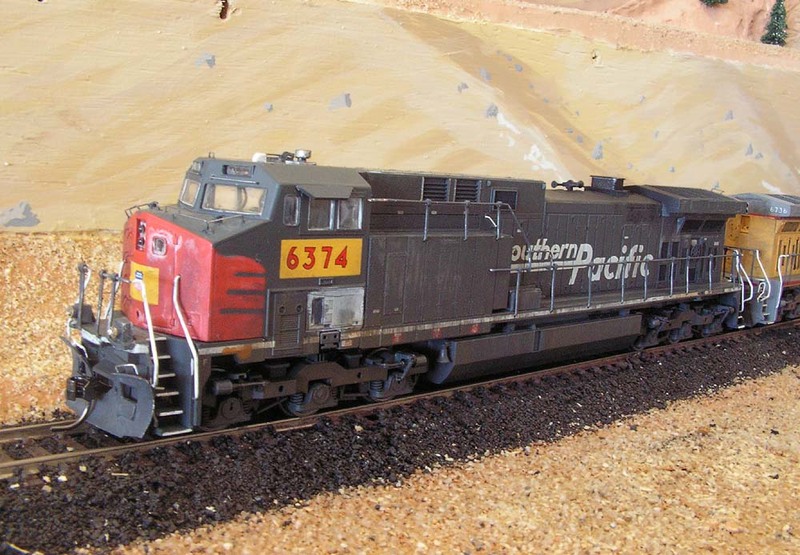 A pair of AC4400’s led by No. 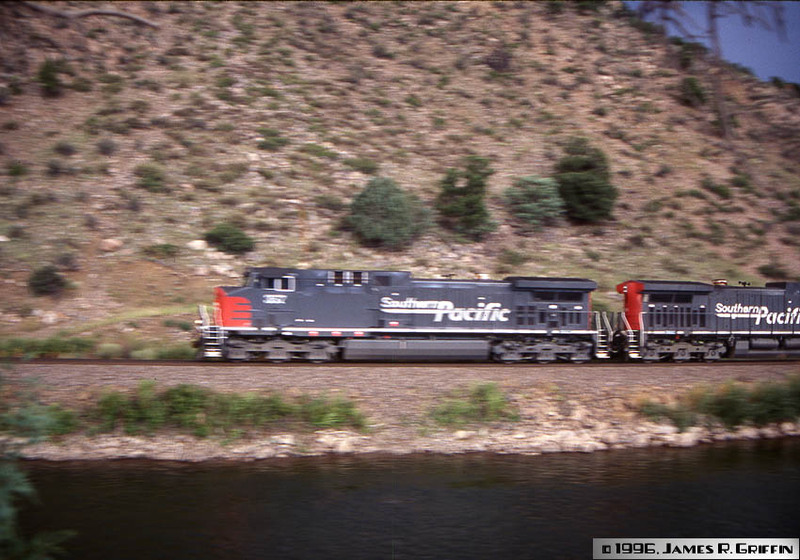 330 have an eastbound coal train at Cotopaxi, CO on Aug. 16, 1996. Immediately afterwards, No. 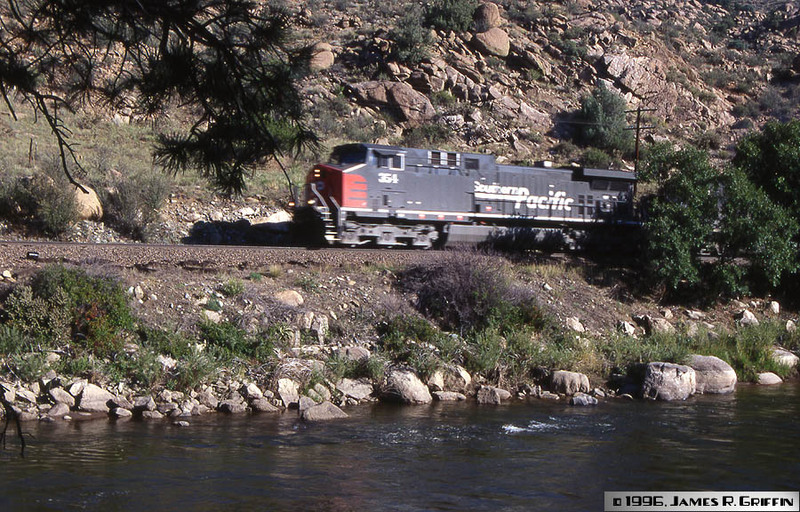 254 led an eastbound freight past Cotopaxi, CO on Aug. 16, 1996. About 7:20 AM on 8/17/96, No. 362 and two sisters are leading a westbound train. 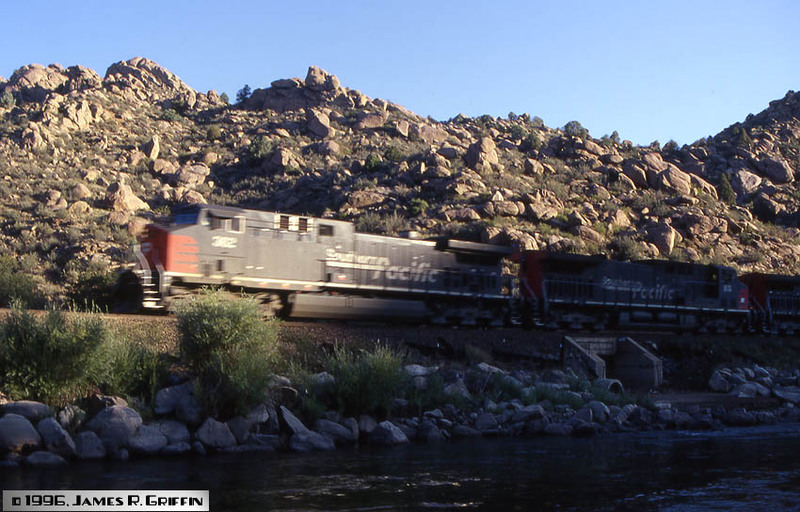 I shot a lot of these units during a three-day trip to Cotopaxi and the Royal Gorge area. 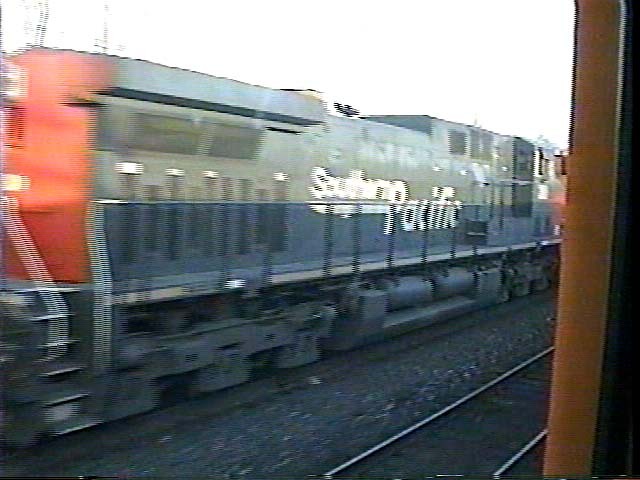 Before the UP merger, SP used the AC’s to power certain manifest trains on its Central Corridor route. Here, No. 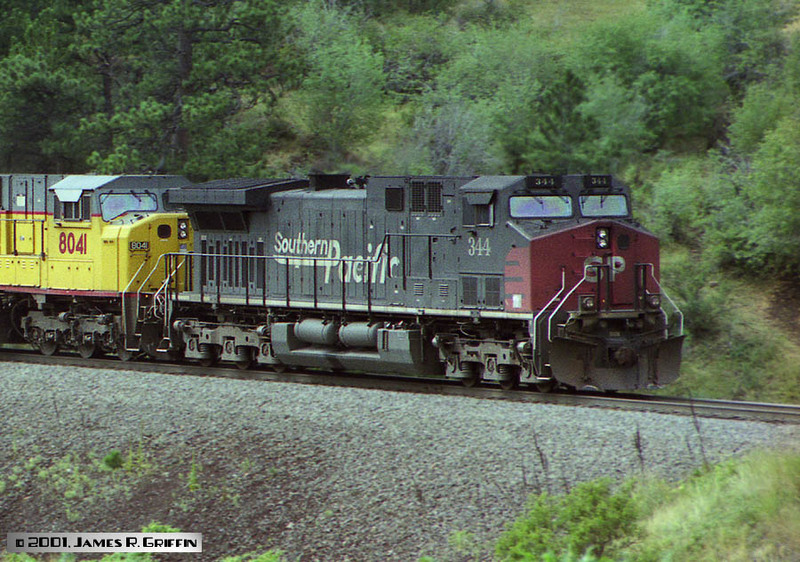 289 and a couple of older tunnel motors lead a westbound at Cotopaxi (Aug 17, 1996). It’s three weeks until the merger, and a year before the Tennessee Pass line was severed. No. 354 is glimpsed through the trees, leading a westbound manifest. If this line were to reopen, I would definitely stay at this particular campground again! On the same day as the previous shots, two units (Nos. 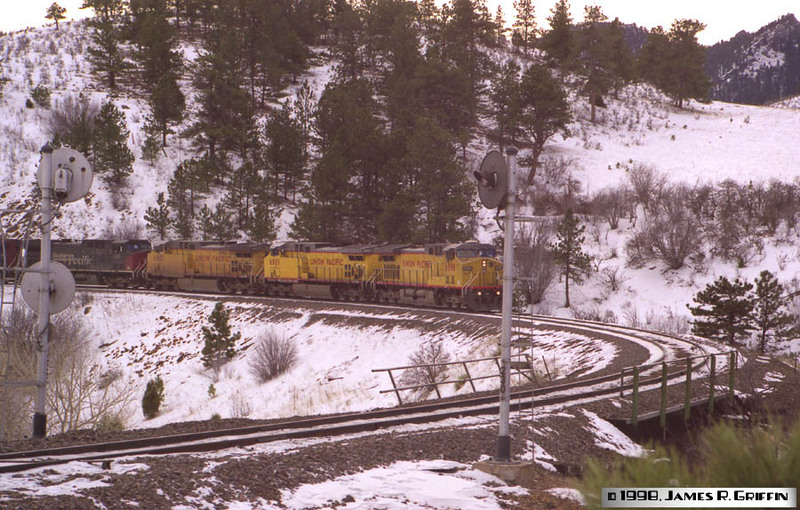 202 and 102) lead an eastbound manifest at Coaldale, CO (east of Salida). The Tennessee Pass route was very busy at this point in time. Barely year later it was cut in two, and through traffic ceased. We chased this manifest train with its pair of AC4400’s all the way from Texas Creek to Coaldale, in terrible lighting (and lighning) conditions. 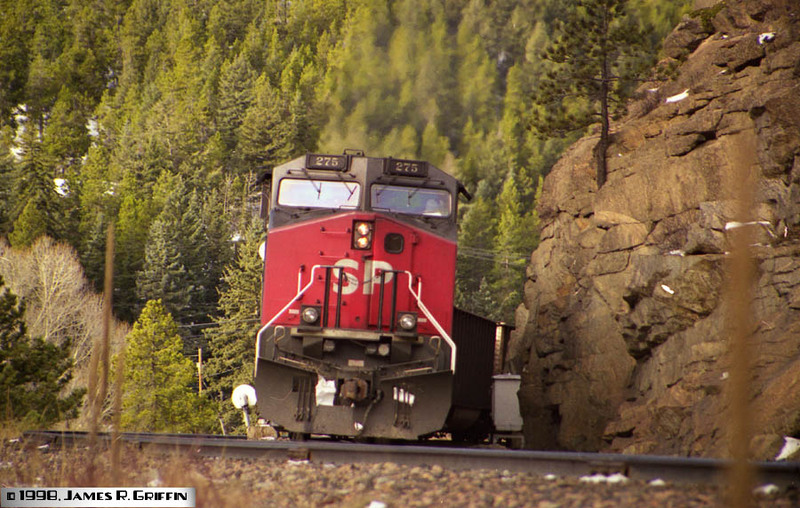 Here it’s rounding the curve at Coaldale, with 357 in the lead. 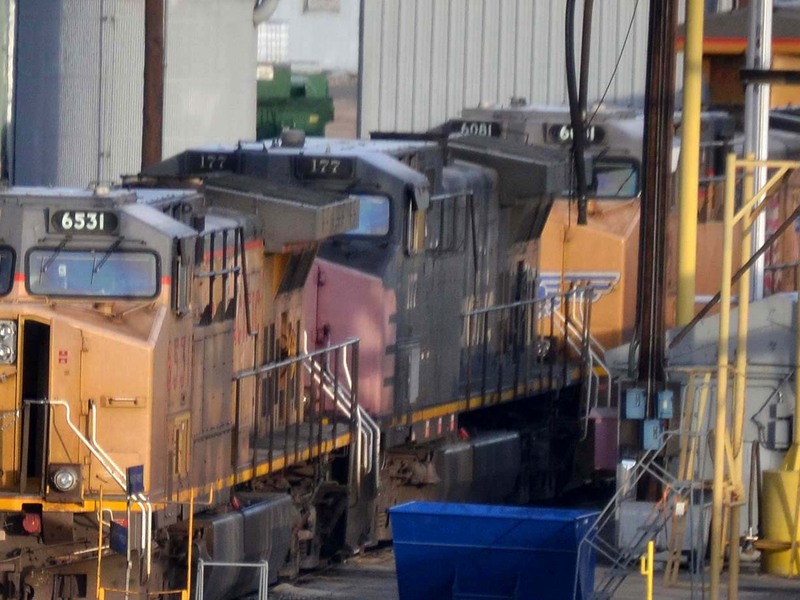 The shot’s a little blurry, but the colors on these yet-new and yet-clean locomotives are still vibrant. These were classy units. The following day, a pair of AC4400’s with all the same numerals but different order (Nos. 326 and 263) lead an eastbounder past the campground at Cotopaxi. No. 263 is a tad grimy at this time. 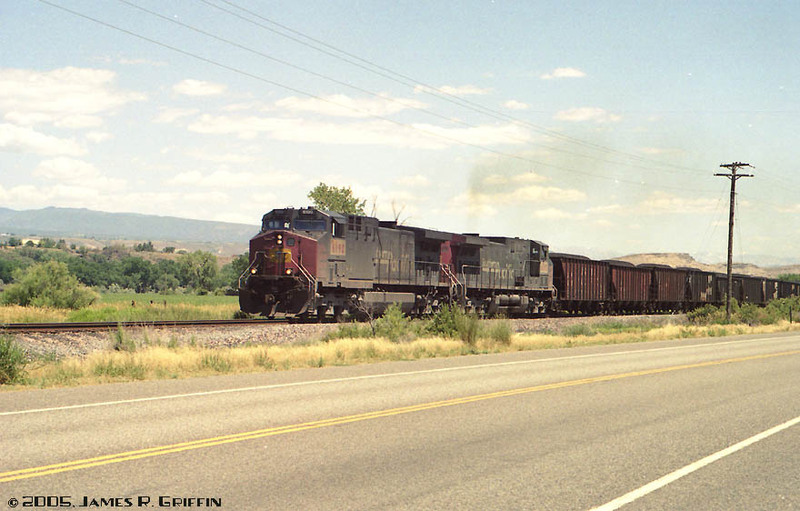 Not long after the merger, January 5, 1997 to be exact, an empty coal train with 2+2+2 Espee AC4400s roared westbound through Crescent on the Moffat Route. Here, No. 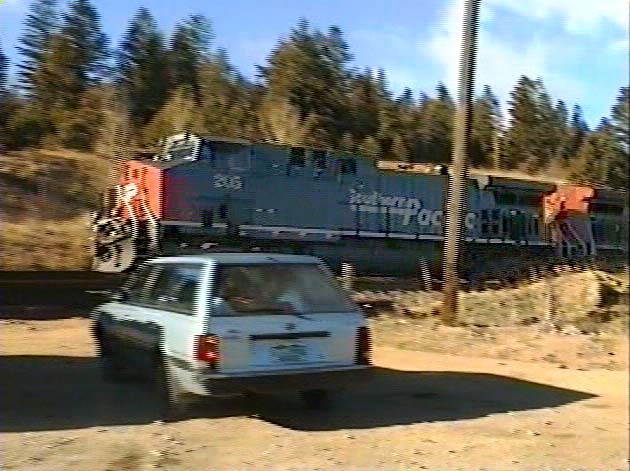 205 is the trailing unit on the rear helper.Image is a capture from video . 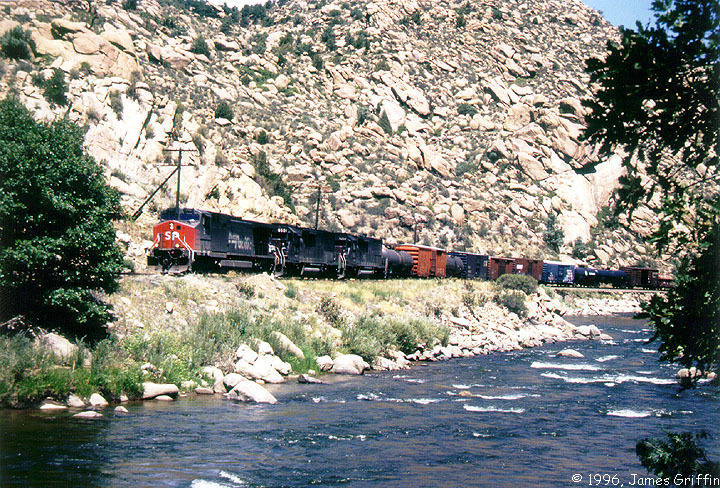 Shortly after the train above passed, a loaded coal train led by No. 305 rolled eastbound through Crescent. Same train as above; No. 272 is part of the swing helper. Notice that the paint is still reasonably clean and shiny, despite the heavy use in coal train service. That will change with time. At dawn on August 3, 1998, No. 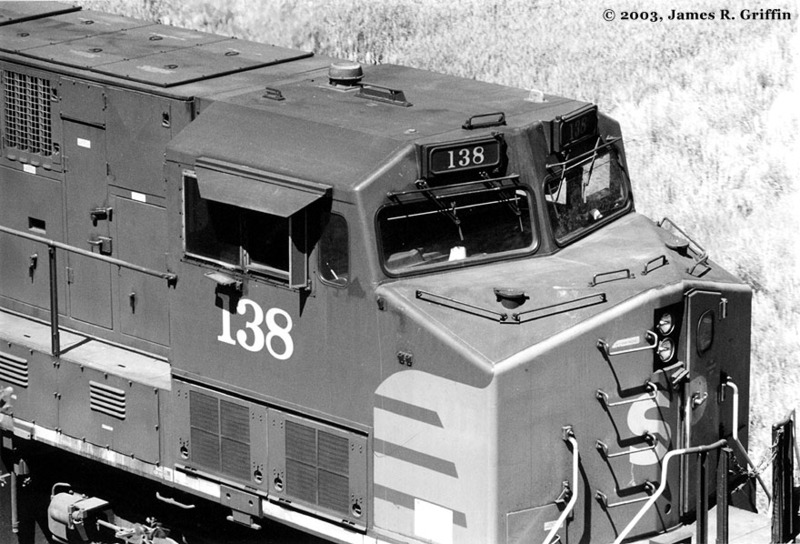 134 waits on the ready line at Grand Junction. Same day as the photo above, No. 146 is also ready to go for more coal up the North Fork branch. Again the same day, Nos. 306 and 186 wait on the service tracks at Grand Junction, in the company of a number of UP C44AC’s and a few second-generation locomotives. The day after Christmas, 1998, No. 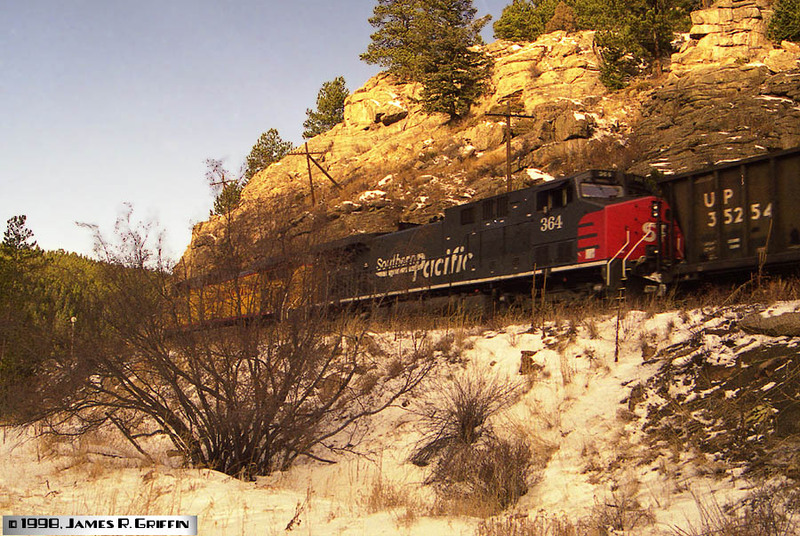 364 is running second on a westbound coal empty at Pinecliffe, Colorado. As usual, it’s cold and windy. Rear remotes on the same train as above, No. 164 is leading. However, since the 100-series lack DPU control capability, it’s actually No. 275 (below) that’s the controlling unit in this pair. Note that all the units on this train are remarkably clean. The day after Christmas, 1998, No. 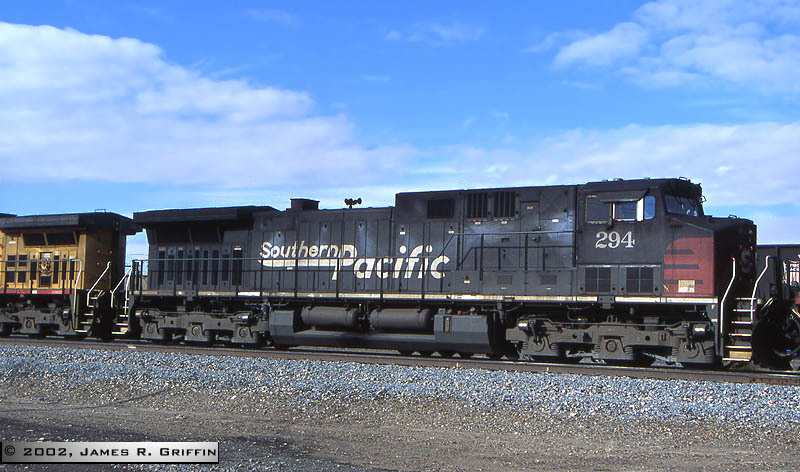 275 is the trailing unit on a westbound coal empty at Pinecliffe. This is one of my favorite photos. 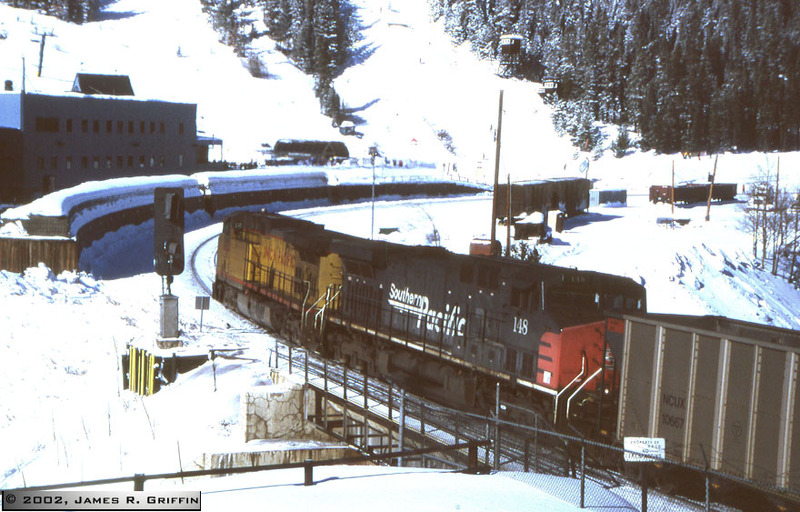 December 26, 1998– a westbound coal empty is about to split the intermediate signals at Coal Creek bridge. SP AC4400 No. 142 is fourth back, and looks to be just along for the ride. There were two other SP units on this train, which had all the power up front (the first three locomotives doing all the work). August 1999 has No. 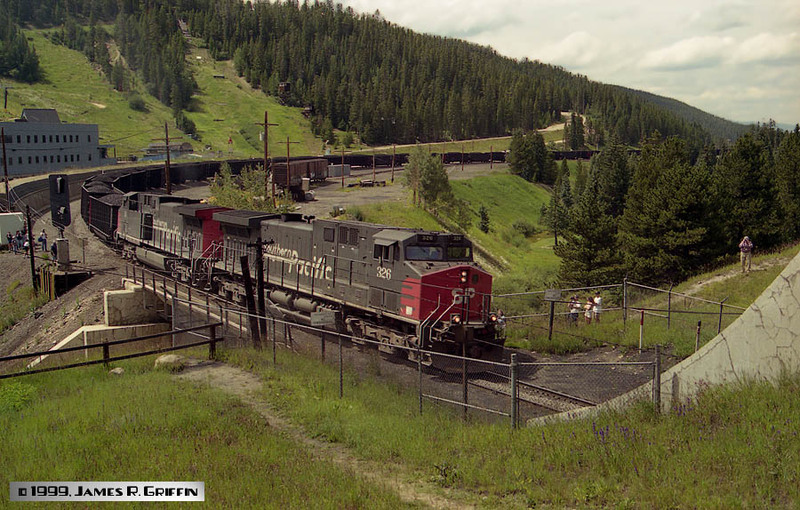 252 leading an eastbound coal train up the approach to West Portal. A UP SD9043MAC is right behind. No. 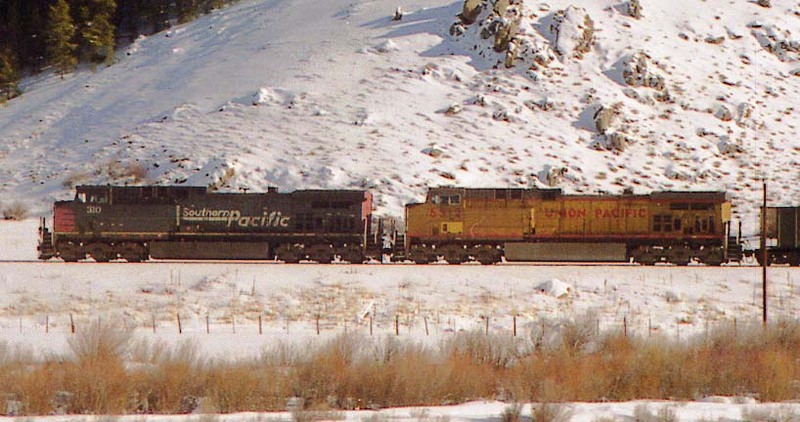 252 is shown below in nearly the same location but very different conditions, in February 2002. 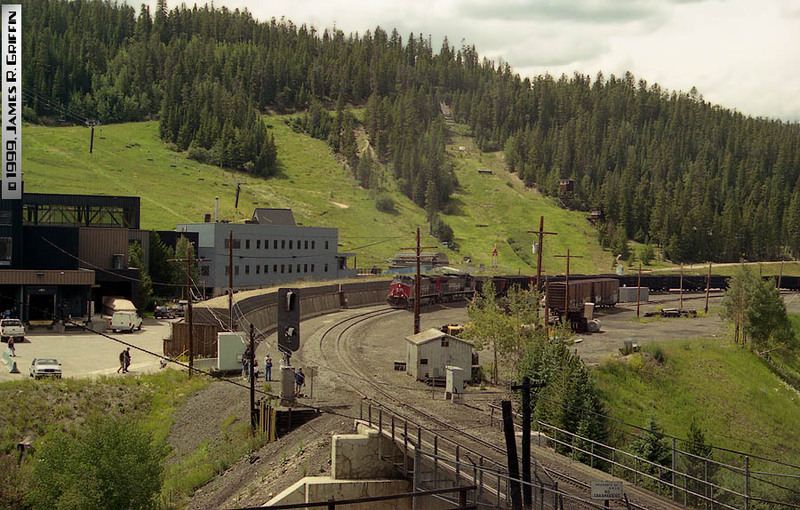 August 1999 at West Portal of the Moffat Tunnel– No. 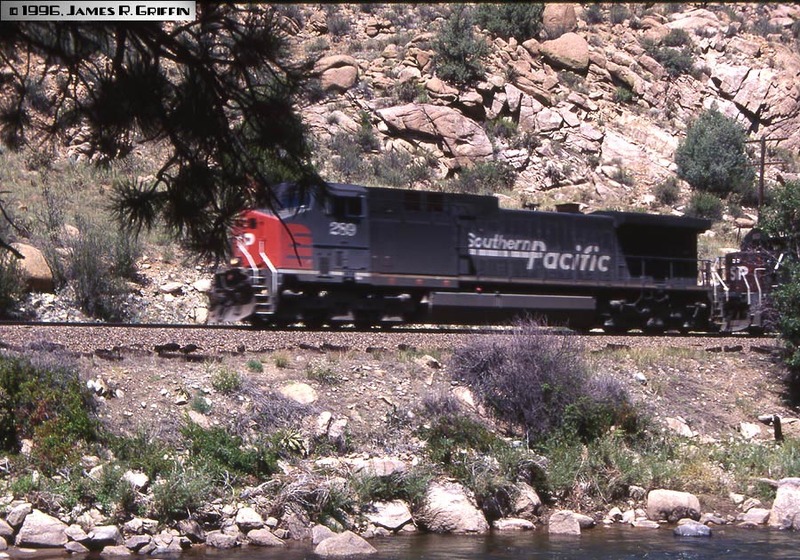 326 leads a PSCX load up the grade. 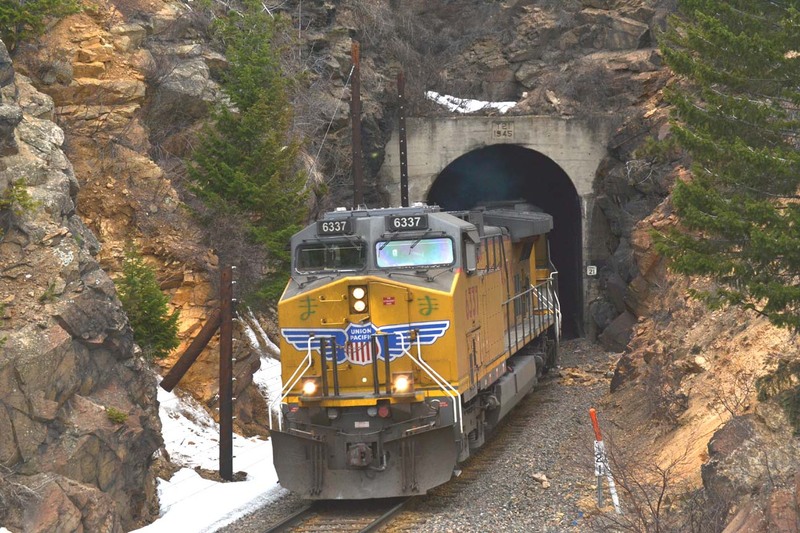 The train is only managing about 10 mph at this point, though it accelerated as it reached the lesser grades inside the tunnel.In this sequence, we can see the train as it negotiates the curve between Winter Park siding and the tunnel portal itself. I can’t quite make out the number of the second unit, but it’s in the 100 series. September 4, 1999: the Front Range was a busy place. Here, No. 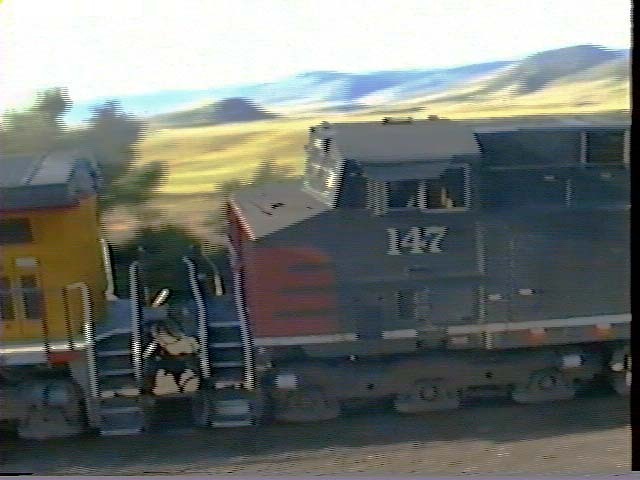 147 is the second unit on an eastbound coal train at Rocky.This and next 4 images captured from video . Same day, No. 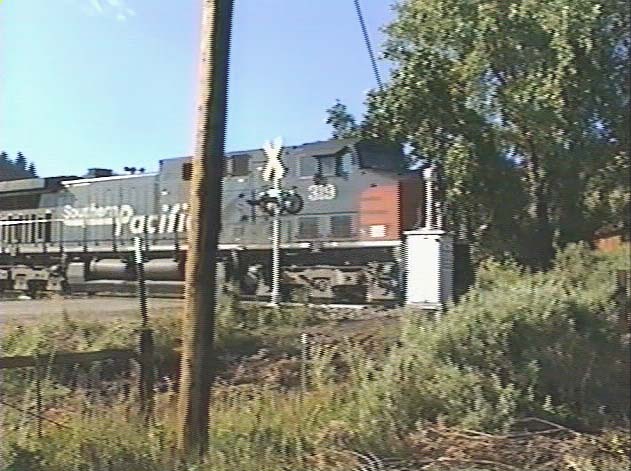 319 leads a westbound CSUX train at Blue Mountain crossing. The train was creeping up the hill towards a scheduled meet at Plainview. No. 153 is the second unit on the CSUX train on 9/04/1999. No. 268 is the lone mid-train helper in this 2+1+2 configuration on the CSUX train on 9/04/1999. 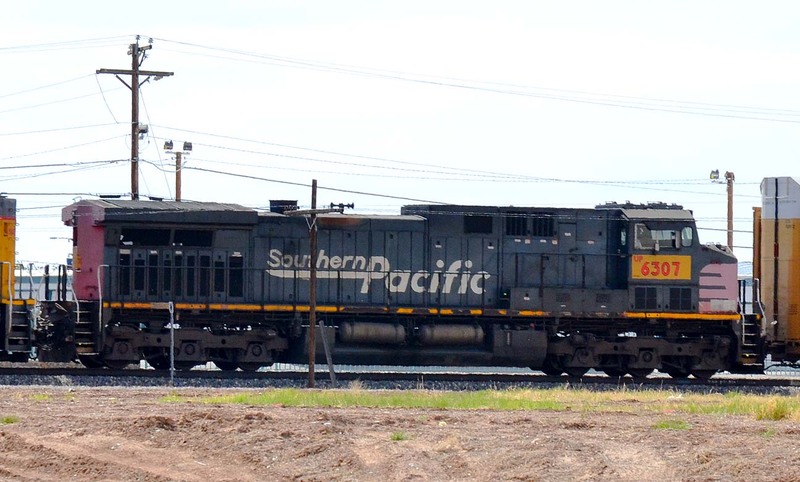 Same day, a couple hours later, a westbound coal empty (4+2 configuration) roars out of Leyden. No. 222 was the third unit from the front. No. 102 is just ahead. 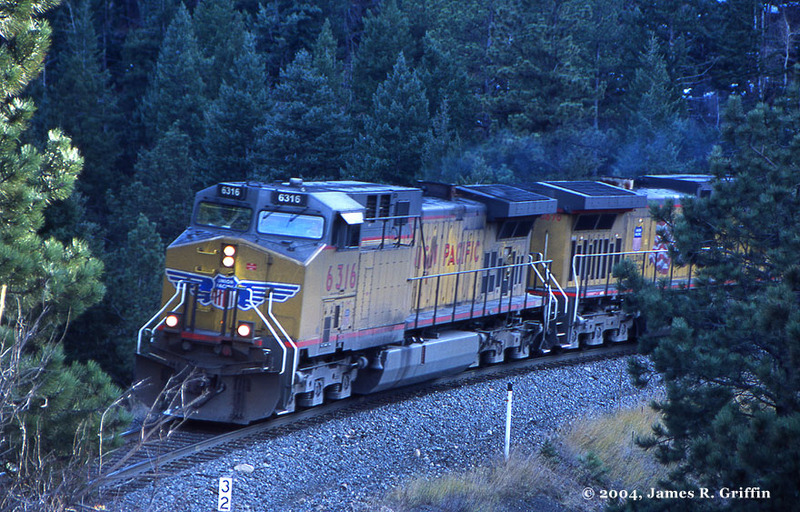 October 9, 2000, another coal train rolls through Crescent, led by Nos. 274 and 114. The locomotives are starting to show the effects of several years of hard work with few washings. On the same train as above, No. 214 is a solitary swing unit. It has received a replacement battery box door, evidently from a UP unit. Late in December 2000, No. 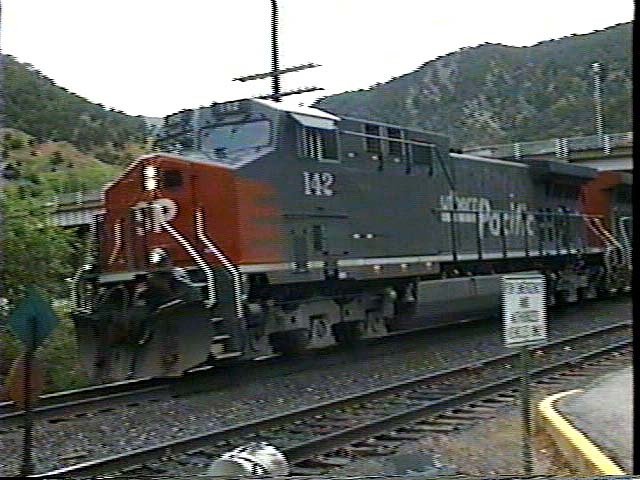 140 is second on an eastbound coal load at Fraser, CO. 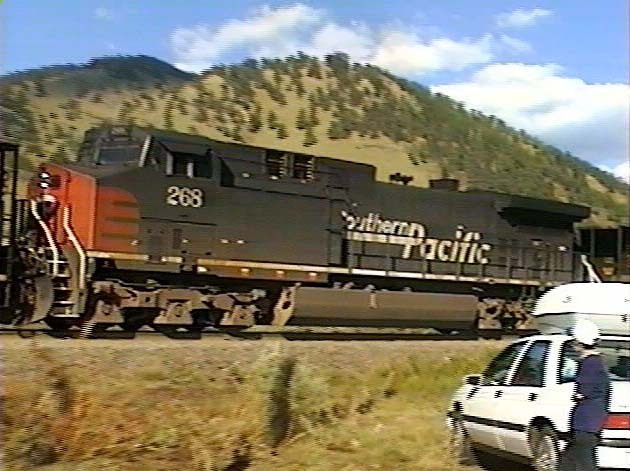 The train is at the toe of the 2% grade leading up to the Moffat Tunnel, and the locomotives are starting to work harder. 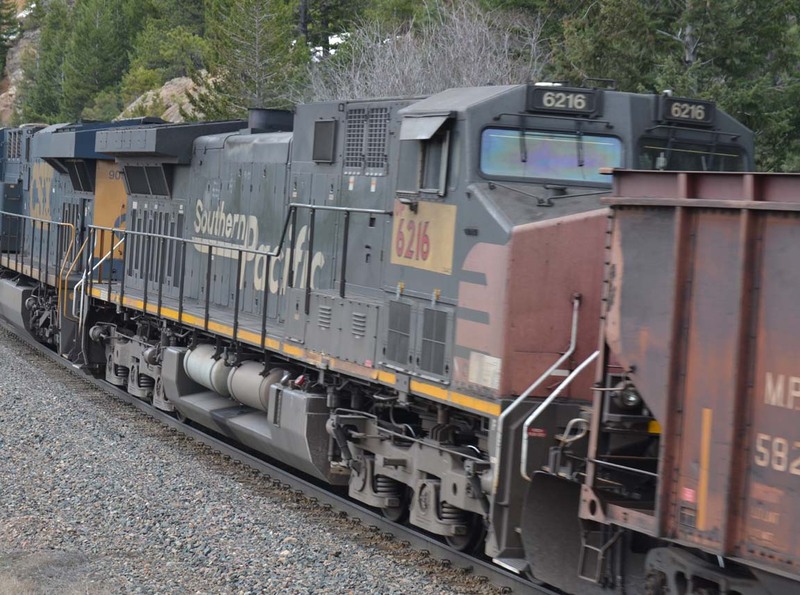 By the time the last of the train was on the grade, its speed was down to a crawl. CNW No. 8808 is leading. Here is the full, uncropped image. 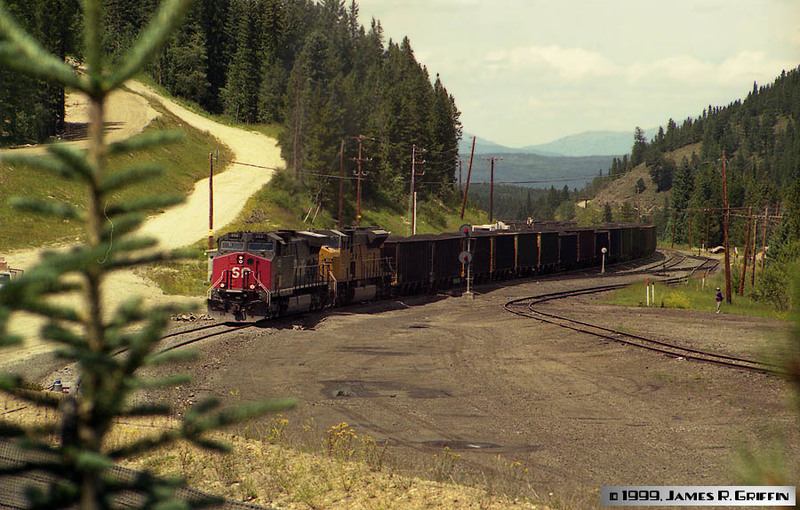 August 2001 at Coal Creek sees another PSCX coal train, led by No. 337. 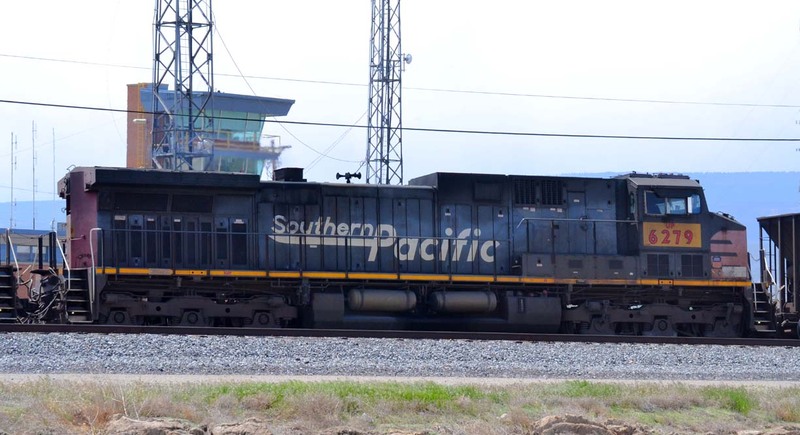 This train had an interesting setup of power: three pairs of locomotives, each pair an Espee AC4400 and a UP SD9043MAC. Evidently they were experimenting with tractive effort balancing. The SD9043’s tend to load up quicker, leading to a jerkier start and more wheel slippage. 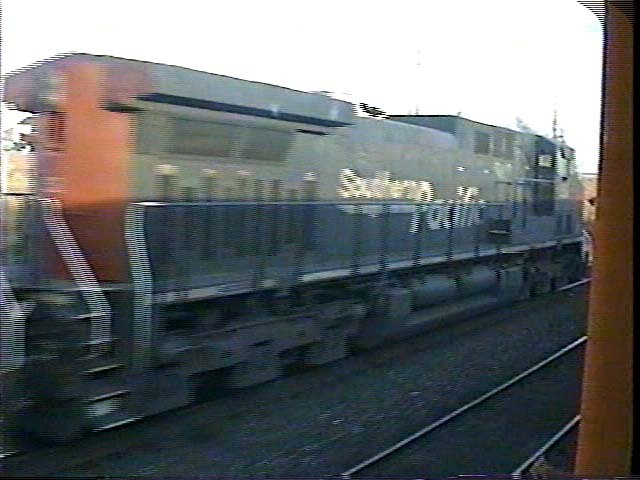 Here’s a look at the rear of the same train, showing the final pair of locomotives. No. 344 is the SP component. Wintertime in the Rockies, and No. 252 leads a load through West Portal. This train had a mix of SP and UP power. 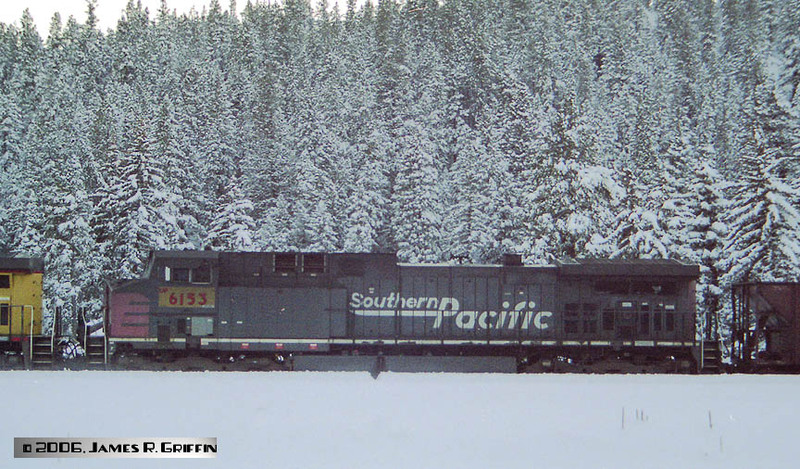 Probably due to the stiffer winter conditions, this train had three units on the point. By the way, this photo appears in my book. Same train as above, with No. 163 and UP SD9043MAC No. 8243 cut in mid-train and pushing for all they’re worth. By now, with most of the train on the lesser 1.1% grade in the tunnel, speed has picked up from about 10 mph to closer to 20 mph. In November 2002 I found No. 294 on the Grand Junction ready line, right by the street. 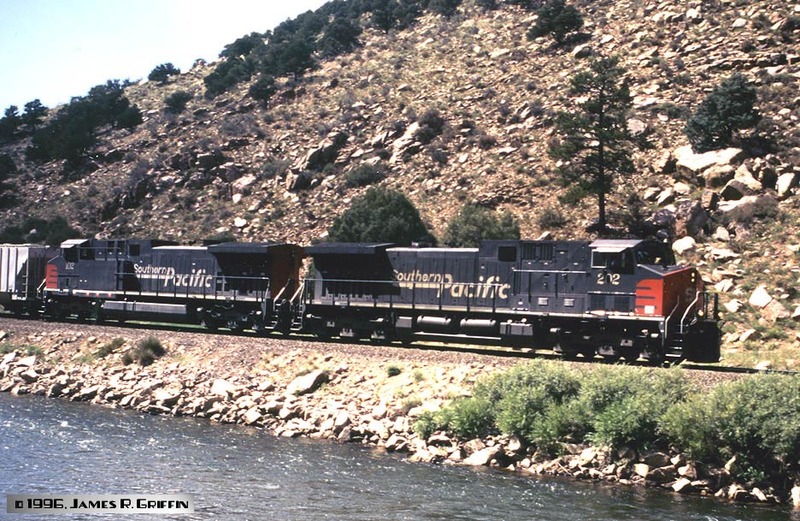 It’s worth mentioning that, up close, these locomotives are huge, at 73′ 2″ in length and 15′ 5″ high..
One morning in June 2003, an eastbound coal load begins its transit of Glenwood Canyon behind Union Pacific C44AC No. 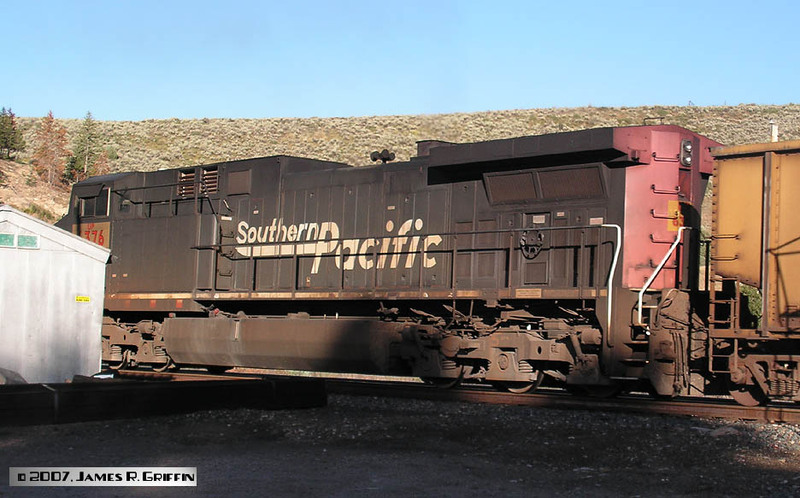 6823 and Southern Pacific AC4400 No. 107— a non-DPU-equipped unit. They’re passing No Name at a pretty good clip, considering the grade and such. Later the same day, over near Paonia, No. 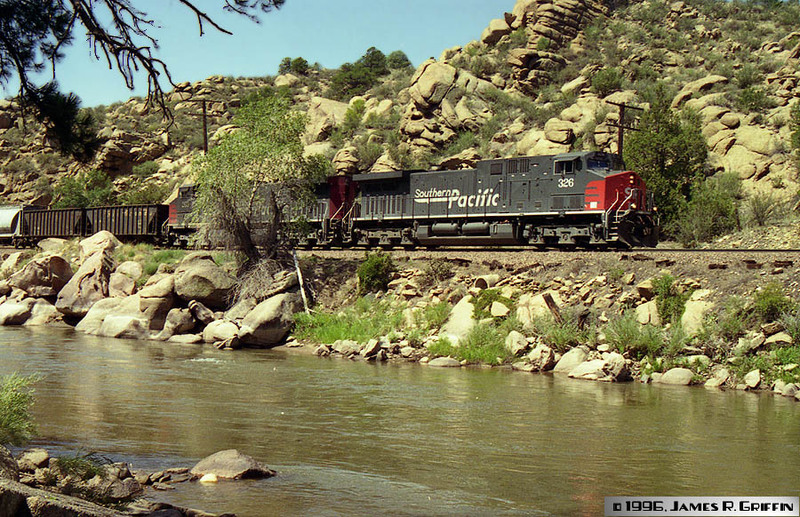 138 leads a coal load under the bridge at Bowie. 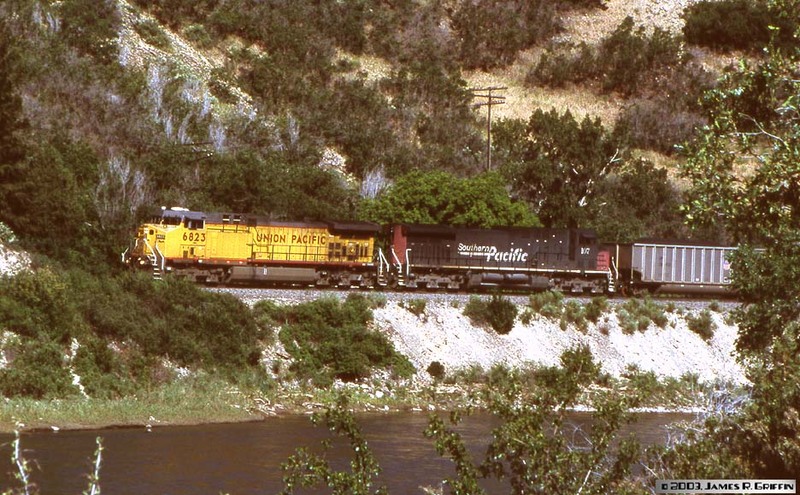 This train had loaded at West Elk. This shot is a good monochrome close-up of her cab. You can see all kinds of interesting details this way. 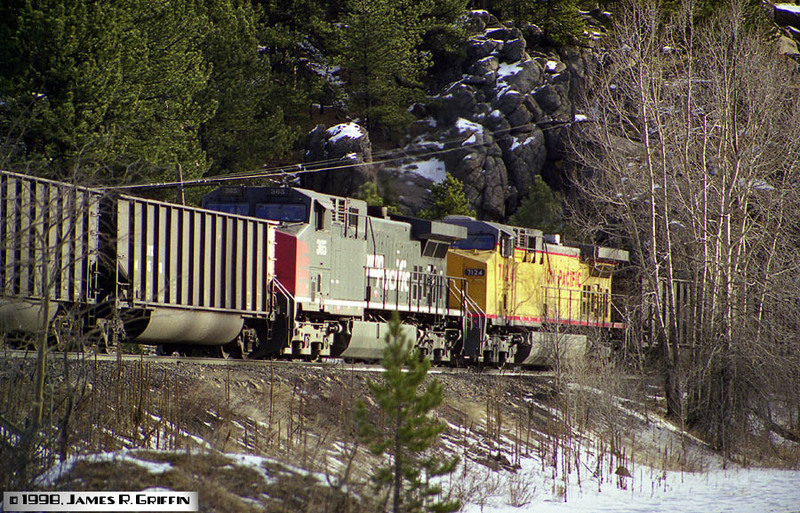 New Years Day 2004: this pair of units is the rear DPU set on an eastbound coal train at Tabernash, CO. No. 310 is the SP component, as yet unpatched after nearly 8 years of UP ownership. Let the patches begin… It’s November 8, 2004. UP No. 6390 is the former SP No. 260. It’s running Tail-end Charlie on a loaded coal train at Crescent. The sun has just gone down behind us. The unit was given this number the previous September. 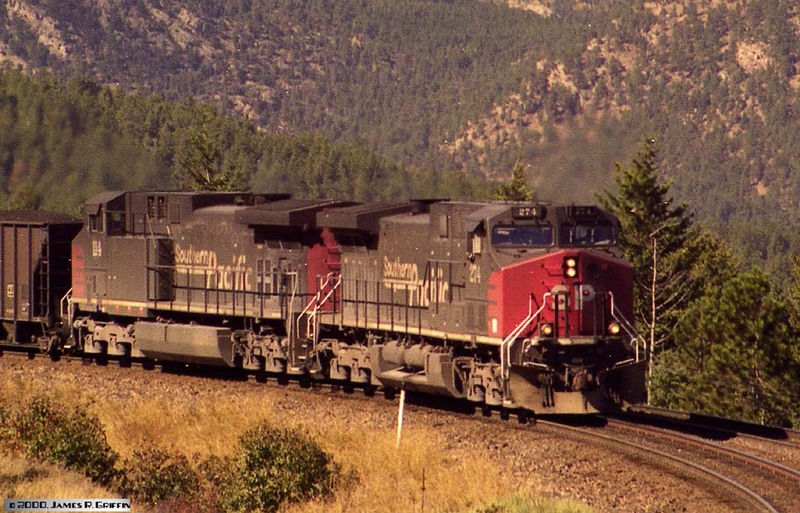 July 28, 2005 (nearly nine years after some of the shots at the top of this page), I encountered a pair of patched units leading a train just east of Delta. Dirty but doing their job. No. 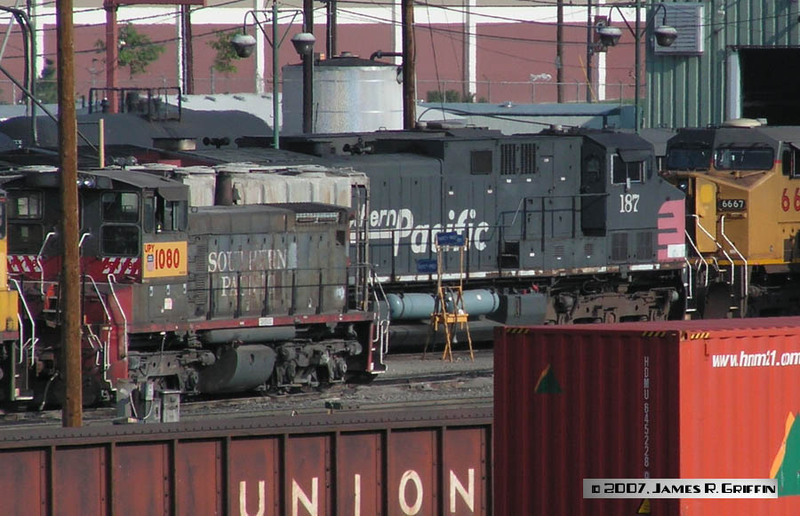 6190 is the former SP 142 and No. 6193 was SP 138 (see the black/white close-up shot above). An hour later, I was quite pleasantly surprised to find two unpatched units, Nos. 144 and 140, at West Elk. 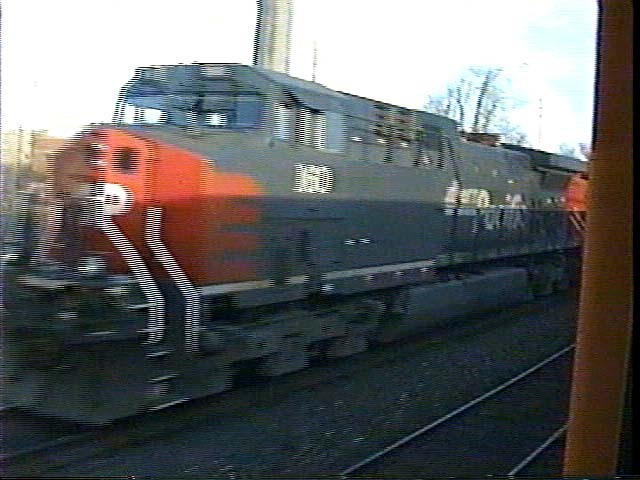 These were some of the last AC4400’s in original paint and number. 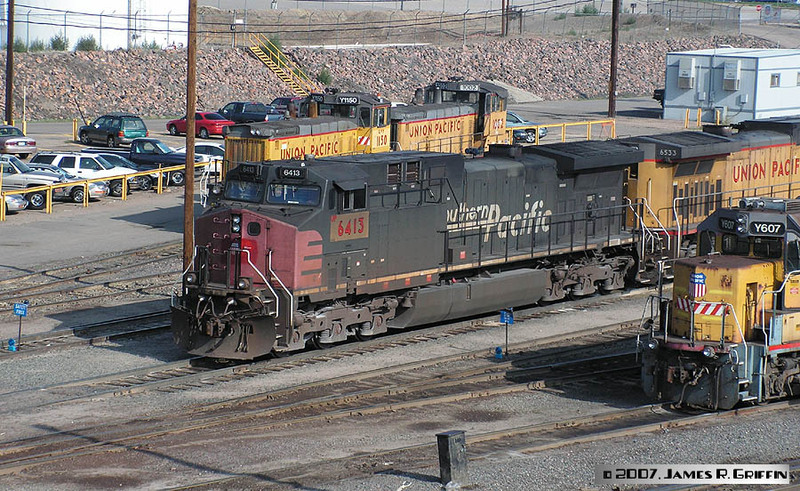 July 29, 2007 in Denver revealed a pleasant surprise: two unpatched AC4400’s. Here is the first, No. 347, with the light on the wrong side for good photos. It’s in North Yard, north end of the loco service area. Buried in the yard and only half-visible, No. 187 waits for a job. It has a patched SP SW1500 for company. More typical of 2007, patched UP 6413 is spotted in front of the yard tower. This was originally SP No. 367. 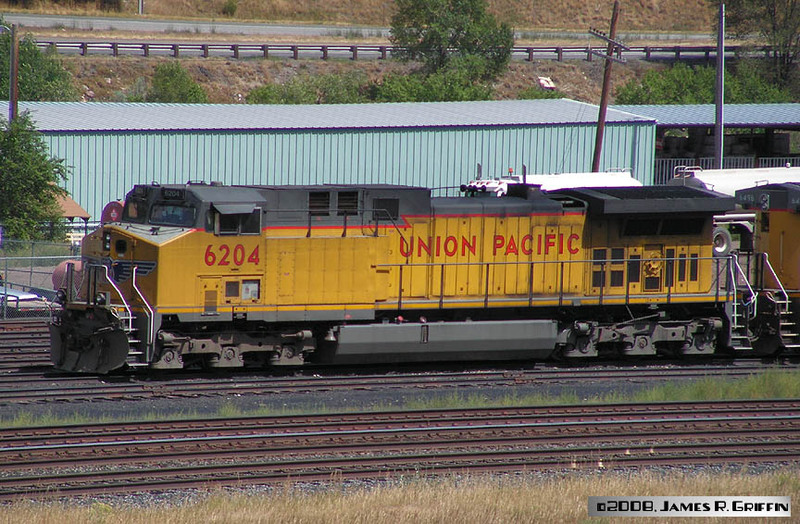 Basic Union Pacific C44AC, right? Look again. This is the former SP No. 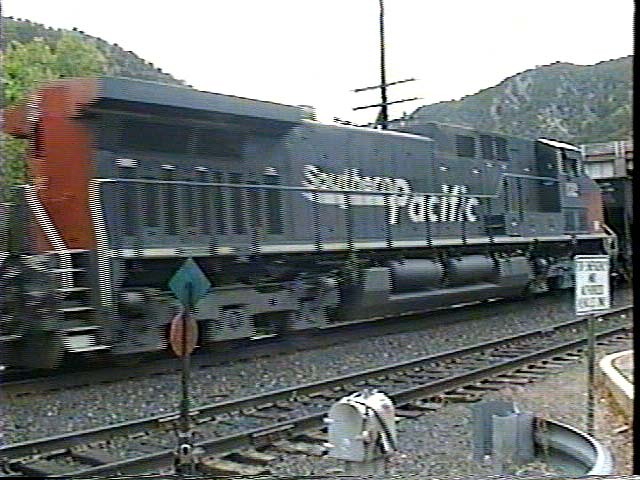 370, leading an eastbound coal train at Sulphur on 8/9/2007. 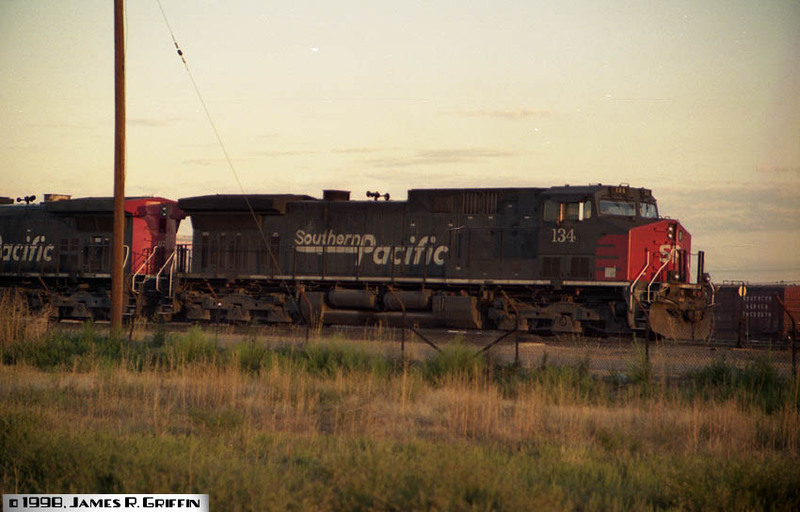 Number 370 was the first Southern Pacific AC4400 to be renumbered and repainted into this series, on May 24, 2000. 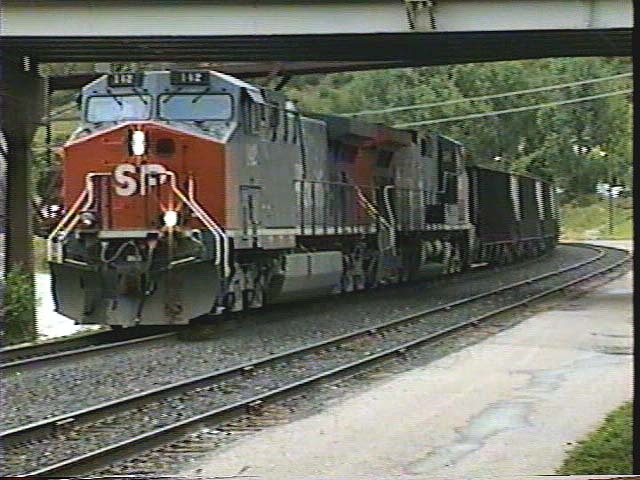 A pair of patched units are in the swing helper at Sulphur on 8/9/2007. Our unique vantage point (on the signal mast) gives a pretty good close-up view… These are the former Nos. 363 and 218. One reason why I don’t like low-end digital cameras– you don’t always have good control of the shutter. No. 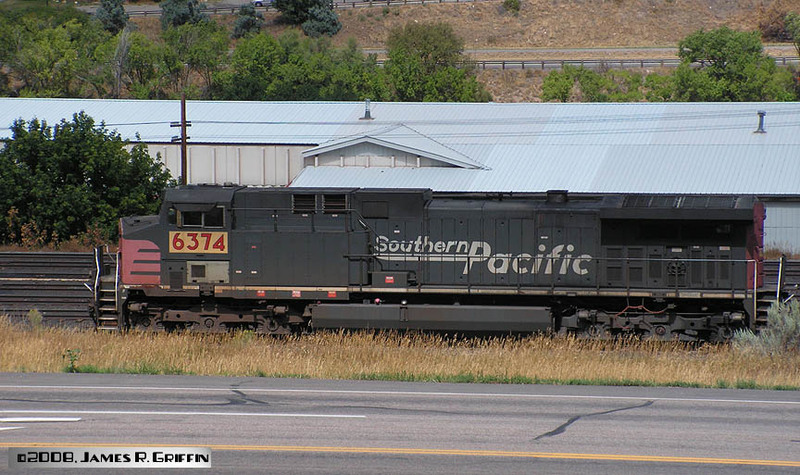 6376 is the former SP 294 (listed above) and is pushing on the end of an eastbound train at Sulphur, 8/9/2007. Former No. 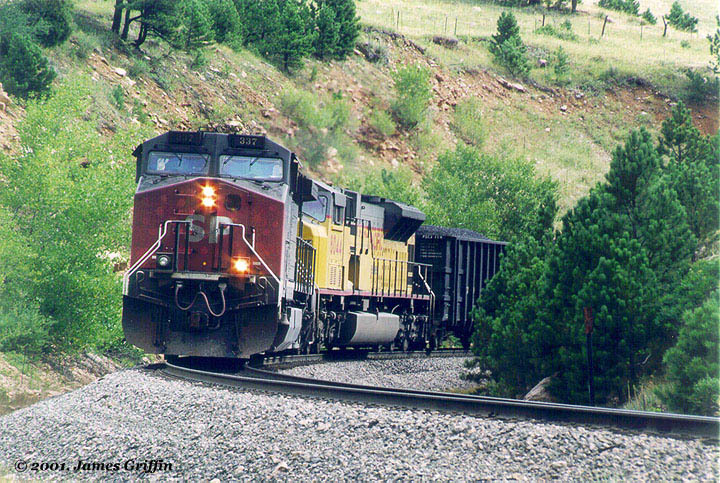 328, DPU’d onto the back of an eastbound coal load as it moves ahead to the east end of Glenwood yard (9/01/2008). Former No. 157, now UP 6204, at Glenwood yard, also on September 1st, 2008. Former No. 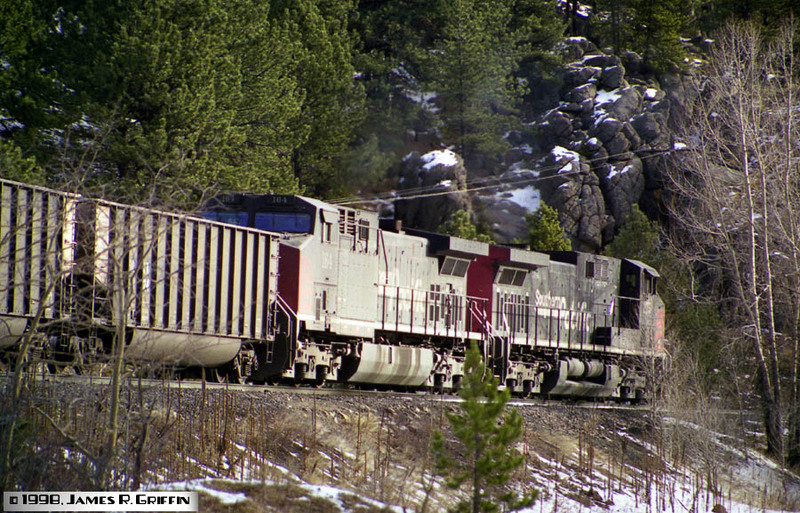 353, now UP 6170, running third on the Denver-to-Roper manifest freight on 12/06/2008. Former No. 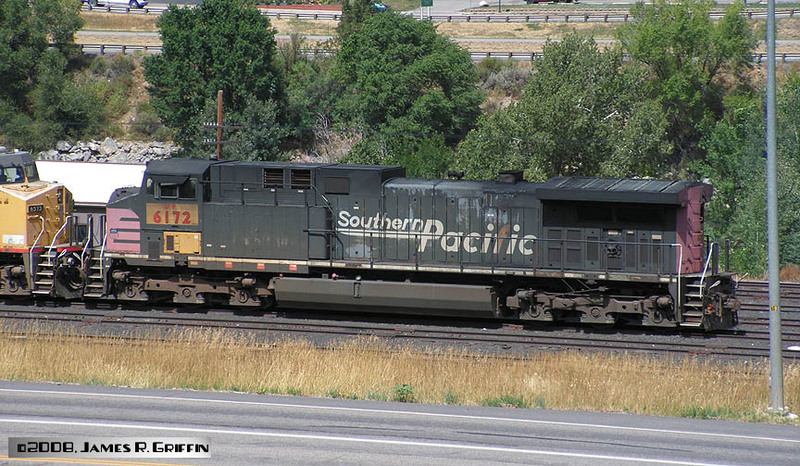 165, now UP 6211, in Glenwood Springs on 7/29/2011. I had overlooked this photo– sorry about the delay in sharing! Unit renumbered in August 2004. Unit renumbered in January 2002. Former No. 292, now in full UP camo as No. 6337 but in its usual haunts on 4/12/2014. 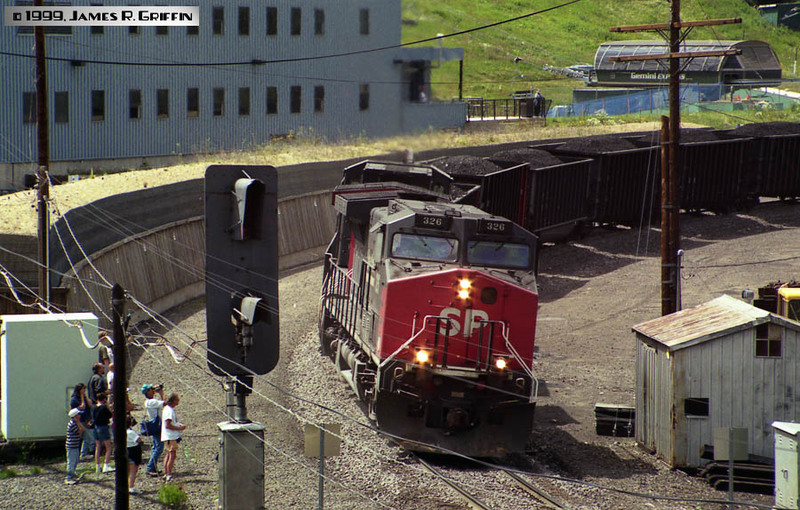 Here it’s leading an eastbound coal load out of tunnel 21 west of Denver. This is a nice big image for your enjoyment! Note the graffiti on the nose. Patched to UP 6216 in October 2007. Former SP No. 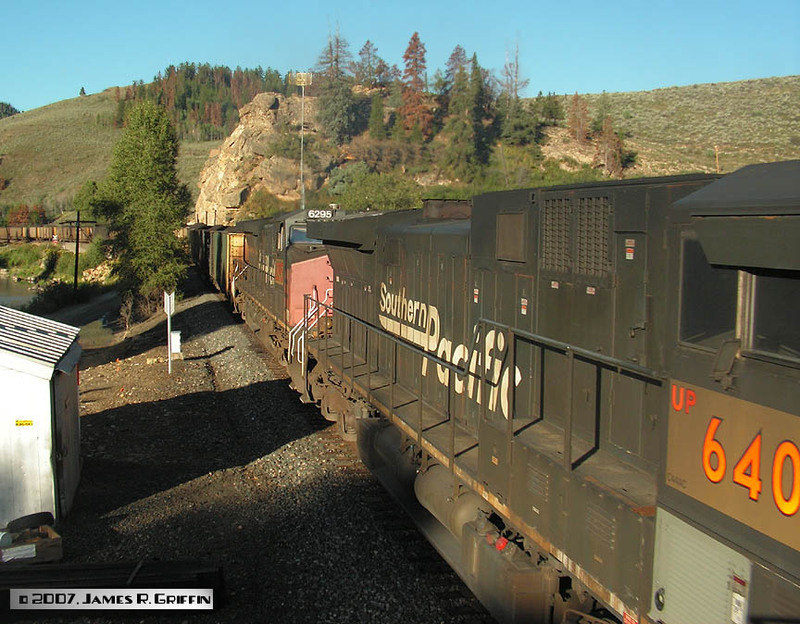 304, a full repaint to UP 6357, is the trailing unit on a westbound coal empty coming out of tunnel 19 on 4/12/2014. Note the complex array of antennae on the roof. Former No. 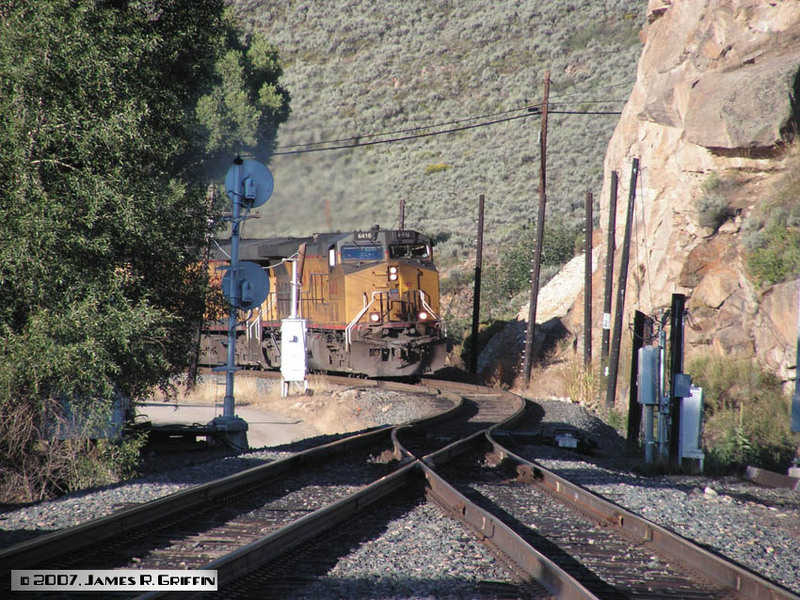 248, trailing unit on an eastbound load preparing to leave Grand Junction on 4/28/2014. 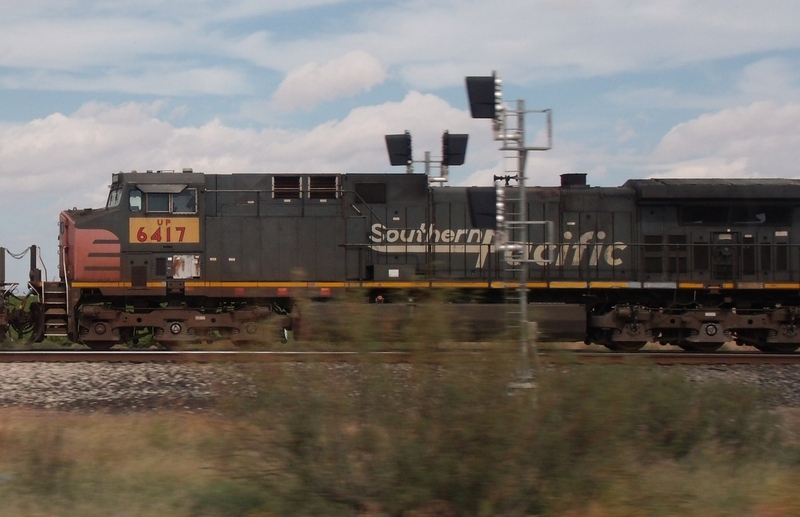 Patched as UP 6279 in June 2006. No. 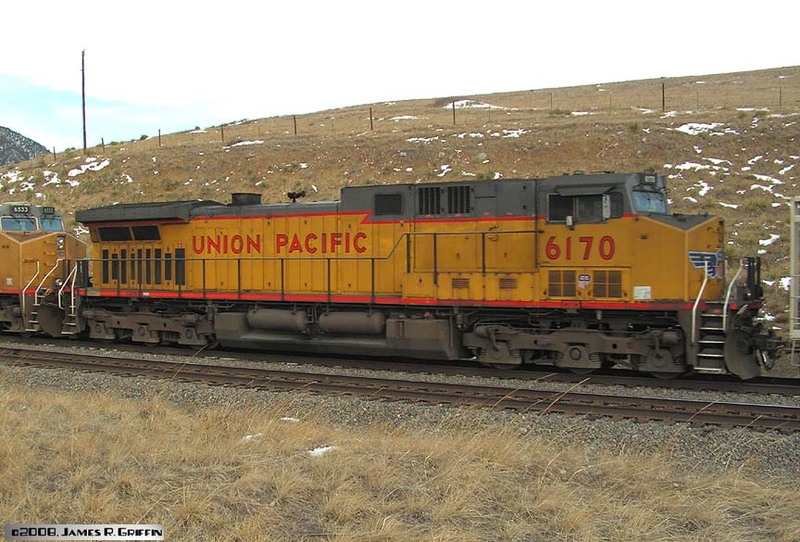 177, one of perhaps a dozen units remaining unpatched as of December 2014. 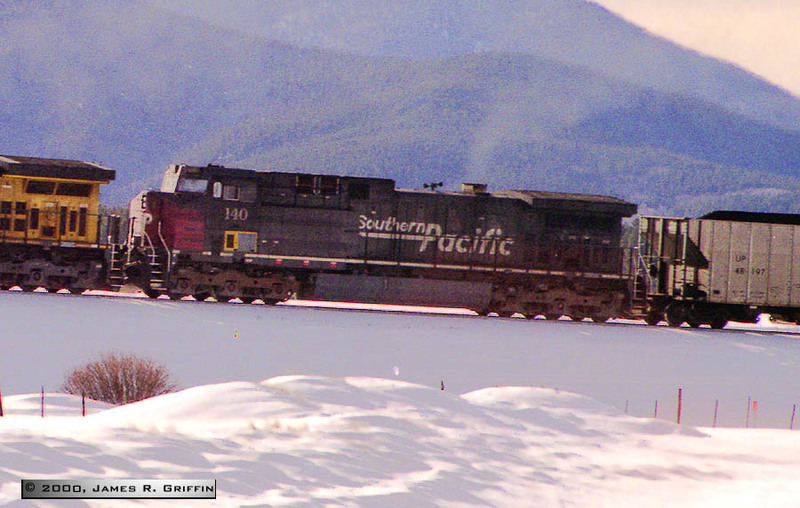 I spotted it buried deep in the service tracks at Denver on 12/16/2014 at maximum telephoto. This is one of the non-DPU-equipped units (not a leader, in other words). It does have the mandated yellow sill stripe of Scotchlite now, of course. This is my second encounter with this particular unit– see the table for a link to its appearance before being patched. No. 6233 on an eastbound coal load at West Portal on 2/18/2018. 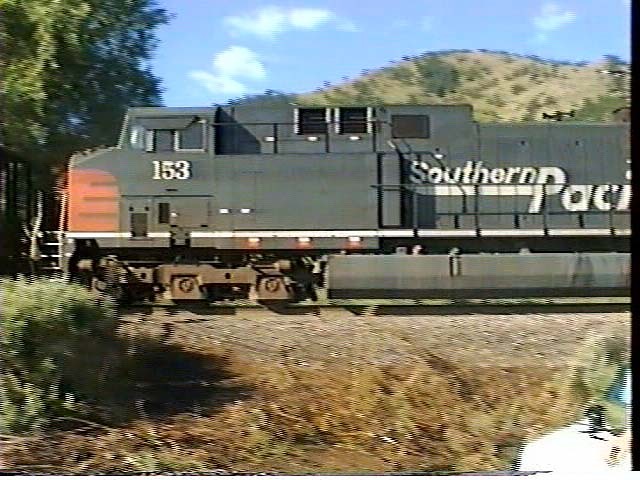 Originally SP 189, delivered May 1995, and lacks DPU controls. Renumbered March 2004, though I guess it was only a patch at that time (this paint job looks far too fresh to be that old).